Rebuilt Power Equipment: Luftkin, Western, Philadelphia, Falk, Terry, G. E.
Power–Flow provides rebuilt speed reducers and increasers. Available from 100 hp to 10,000 hp, gearbox brands including Lufkin, Western, Philadelphia, Falk, Terry, G. E. and more. Equipment can be obtained in used “as is” condition or rebuilt ready for operation. 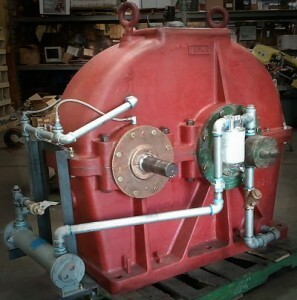 Rebuilt equipment is disassembled and inspected with parts repaired or replaced as needed to test. PFI carries over 100 used gearboxes in stock and has access to several hundred more for quick deliveries. We can rebuild these units to fit most any of your speed increasing and reducing needs. WHAT PART CAN WE GET FOR YOU?